The whole weekend felt a little like a balloon three days after the party, when rubber skin once tight and shiny deflates slightly into a flaccid duskiness. Yeah, you can squeeze it and see what was, but each time you do, it goes back to being a little less. The Columbia River Classic used to be a big event. Not like The Pacific Northwest Historics in Seattle on July 4th, or the Portland Historics usually held the week after. But the Classic, ending the summer on Labor Day, has always been a popular race. We remember August asphalt that someone once measured at 140 degrees with an infrared thermometer. Crowds. Friends. There weren’t enough cars this year. It rained, a little, on Saturday. Not enough to matter, just enough to dampen things. Falcon wasn’t there, neither was Stang. There wasn’t a row of Porsches along the back rail. The list of people we remember is getting longer than this weekend’s entry sheet. Our sport may be dying. We talk about that, trying to think if anything can be done to push back against the tide of demographics, the “aging out,” how to reach a generation that doesn’t love cars, who text rather than cruise. I think we know the outcome, though we pretend there might be solutions. Family Guys, father and son, talked about it the way they always talk about everything, finding a way to laugh. Canuck showed up for the weekend, though. So did Cowboy. Small Block was there, supported by Kiwi, and Merlin came down with Ceegar. Family Guys, father and son, brought the Rex Easly Studebaker. Beater showed up with his new wicked roadster. Blue Cat showed up with his nice Jaguar. Magnum, a great guy all of us like and none of us can figure out, was there from Portland with his Tiger. Nice Guy had pulled the twin carbs off his TransAm Camaro and put on a single. It was faster, I think. Funny how that goes. In a world of “It’s never enough,” sometimes more is too much. I got a dose of that this week. I’ve been jamming big rubber under the fenders for years, and it finally got to the point where the tire would smoke when I hit a bump. Everybody’s been going to flares since we don’t really have to be production cars anymore. So me too. The only flares I could find after Road America were big. I put them on in a hurry for this race, didn’t have time to cut them down, and my once sleek and sensual Corvette looked like that woman in the market who wouldn’t let me past to get ice for my cooler, standing in front of the frozen dessert case, her hips four times the width of her shoulders and her basket blocking the aisle. But I shouldn’t bring that up. It was probably a genetic condition. It was Canuck’s last race of the season with us, but that’s not why he wanted to win. He wanted to win because he’s Canuck, and because he’s just like the rest of us. I wanted to win because it’s Portland, and being beat at my home track has twice the sting. 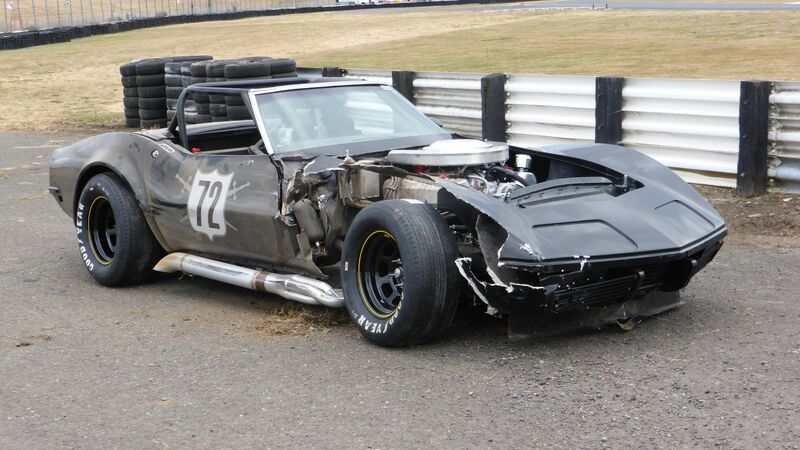 Cowboy never seems like he wants to win, except when he’s out on the track and anything goes. That’s how it went, by the way. In this last race. But bad things happened before we even got to that point. The Gold Mustang, from even further out in the Oregon weeds than Cowboy and me, showed up. It’s hard to define the difference between what they do and what we do. Some of it’s attitude, I guess. Like they have a chip on their shoulder about nearly everything, and have to make it personal. Maybe it is personal, at this point, but the Ford vs. Chevy thing seems a little weird by now. Some of it is team judgement, since that car has been involved in most of the car-to-car contact over the last few years, it seems, even with different drivers at the wheel. Most of us back off when paint or panels are about to be exchanged. But those guys do stuff on the track most of us won’t, which changes how it feels out there, and if they win doing it, there’s a little rooster dance. Feels like a blister you have to ignore to get the job done. Anyway, Canuck and I were going at it in the first race. I jumped him on the start, and held him behind me until the checker. I saw Cowboy trying to sneak by me on the inside to my right, but either because he’s done that to me a dozen times, or because I’d been burned that way at Road America, or just because, I moved over. No. Just no. It wasn’t going to happen. Not this time. I thought I’d be able to stay ahead of Canuck and got clear of the chicane with a small margin. That’s how it happened, too, in that first race. Even though Canuck was turning a time about one-tenth of a second faster than I was over all, I knew where he needed to be to get around me, and I was where it would take him three tenths of a second to make the pass. Ceegar got around Gold Mustang on the very last lap of that race. I don’t know where Beater was in that group but I imagine he was right in the middle of the action. I did the same thing to Canuck in the afternoon. I knew I had more grunt at lower speeds, so I kept the speed low on the pace lap until the green flag and then hammered it to get in front by the first turn. It worked, and I kept him behind for the entire race. All three laps of it. Canuck, Cowboy and I were fighting our own battle up front. Behind us, Ceegar had just come onto the back straight, barely ahead of Gold Mustang and Beater. Beater said they were all really tight together. Suddenly, Ceegar’s right rear tire went flat. He started to fish tail. Some of us would have backed off at that point. But Gold Mustang saw an opportunity and tried to scoot by. It’s hard to time that sort of thing, a fish tailing car, and he tagged Ceegar in the right rear taillight, which put them both into a spin. Beater had little choice but to try to get through, but Gold Mustang hit the wall and launched across, hammering Beater on the passenger side. It was a mess. I was in front when we came around and slowed way down to bunch up the field, but they brought the pace car out anyway to keep us under control, then decided to just end the race. It took a while to clean up. They even left Beater’s car out there on the other side of the wall. He picked it up later that evening. Some of us were hot, because of Gold Mustang’s history of contact. But Cowboy, like he usually does, brought it all into perspective. “They should write it down as ‘Flat tire causes racing incident.’ And then close the book on it.” And that’s what they did. Yeah, maybe. 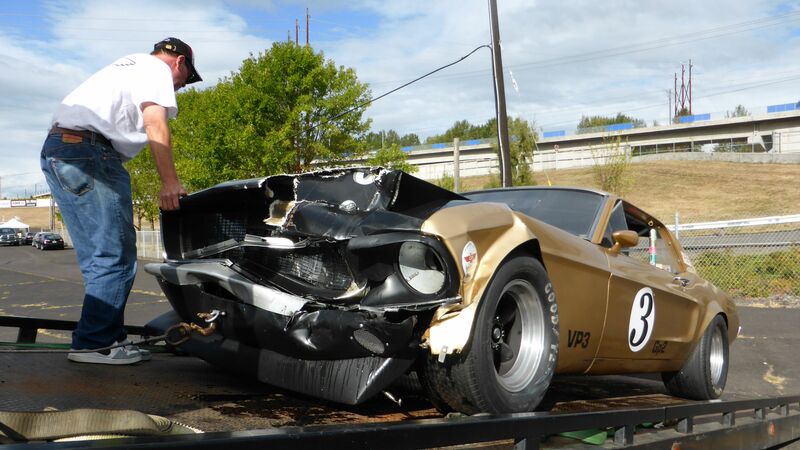 Even Beater wasn’t willing to lay blame, though Ceegar said that if Gold Mustang had waited even another two seconds, he would have had his car under control and off the track. Canuck beat me Sunday morning. About the middle of the race, he came into the chicane on the inside and got through before I did. I’d had to mostly stop using my brakes for two laps when the pedal went to the floor after I boiled the fluid front and rear. But he outdrove me the rest of that race, too, with the fastest lap time. Our lap times were within a tenth of a second all weekend. That’s a tenth of a second in a race two minutes long. But Sunday afternoon, Merlin bled my brakes and Jakester put on what were hopefully my least worn set of tires from Road America in July. Cowboy walked up with a paper crown from Burger King, saying the winner of the afternoon race would get the crown for the weekend. It went on Canucks table just by assumption, I think. Canuck wasn’t going to let me jump in front this time. Later he said, “I learned something from you in the morning.” He was on the pole so he got to set the speed to the green flag. He set it high, where his motor would have an advantage over mine. But either because he’d stretched out the field getting to that speed, or because Cowboy or someone else was not in line, they waved off the start and made us go around again. The next time around, the green flag came down but I still couldn’t get in front. Canuck kept me out to the left. Then, out of the corner of my eye, I see Cowboy hurtling by even further to the right, inside of Canuck, running along the rail. I was barely going to be able to slow for the right angle turn. Cowboy didn’t have a chance. He spun into the center of the chicane. Canuck had to blow straight through instead of turning right to avoid hammering him. I made the turn but barely, bumping over the rumble before making the sharp left to go racing. Canuck kept going, though the rule book says you have to stop and wait for a signal to go again. I tried to catch him but I couldn’t, even though I had brakes and my tires were working better than the greasy skins I’d taken off. I was closing the gap when we hit traffic, then I ran out of race. It was over. Back in the pits, Canuck was hot that Cowboy had crowded the start. Canuck knew he was supposed to have stopped, but kind of went back and forth about what he coulda and shoulda. He came over to give me the crown since I was second, but I told him I didn’t want it if I couldn’t beat him on the track and not with the rule book. When he insisted, I told him I would only take it if I posted the fastest lap time. Cowboy later said his transmission locked up, which is why he spun. It can get a little busy trying to find a gear with a box that doesn’t want to cooperate and you’re in a high speed pack coming to a right angle corner. I was packing up when Jakester brought over a time sheet. They’d given me the win because Canuck had been penalized one lap for blowing through the chicane, but that didn’t matter to me. What did was I’d posted the fastest lap time. I asked Jakester to take Canuck the time sheet and bring back the crown. It’ll go into the personal book as a successful weekend, but like I said at the beginning, it didn’t feel much like a celebration. More like a tired party balloon, or a pizza box half full of cold but whole slices. You’ll peel one off the cardboard, and it can be pretty good, but it’s not quite as good as it used to be, or it could have been. Hard to say why. For a movie of the classic, click here. It’s just a series of scenes from three of the races, and not meant to do anything besides give a feel of the action. Great observations about future of the sport, and how the players have maybe changed attudes at just the wrong time. The alure of old Detroit Iron has faded with the death of the drive-in theater, and back-roads beer has gone to pot ( horrid pun acknowledged). Auction prices have driven away all of us who still have the bug, but notbthe cash.